I started playing Scenario no. 13, the campaign from 1762 to 1764, and was surprised when I noticed that Quebec was owned by the Prussians instead of the British, who historically controlled the city after the Battle of Quebec in September of 1759. I checked the other scenarios and saw that they were correct, except for Scenario no. 12 which has Quebec under the control of Austria. The city can be entered in the 13th scenario, but not in the 12th, and it isn't a strategic city. 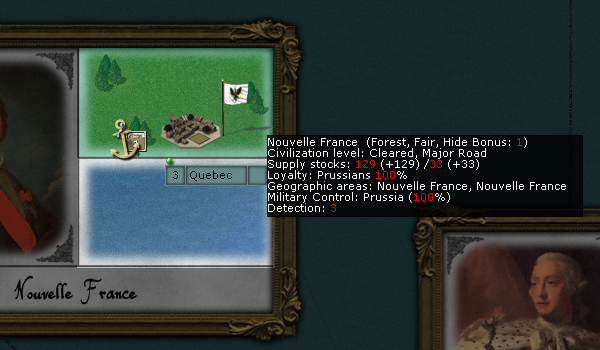 Is there any gameplay reason why the British wouldn't control Quebec? Did you see the French or British flag on Quebec, or another flag? PhilThib wrote: Did you see the French or British flag on Quebec, or another flag? The date is "Early May," 1762. OK, this confirms my suspicion. It seems some special instructions are missing in that scenario, the ones that give customs flags to regions (in that way you can see non-Prussian flags in the regions of Prussian allies...). Note taken for future fix, won't affect gameplay for you anyway, this is purely cosmetic. Yes, I noticed that it has no effect on the scenario. It is just bizarre to see a Prussian flag there.